Look cool and chic any day. City life is exhilarating. Its fast pace keeps you on your toes as you face every challenge that the urban jungle throws your way. As every fashion girl knows, the best way to deal with a problem is with some flair—but tempered with practicality. Opt for an ensemble in lighter, breathable fabric. This summer, try a lightweight blazer for the office. On the other hand, you don't always need to wear a suit to look sharp. Choose chic yet comfortable pieces that will make you look like a cool girl boss, like a ruffled off-shoulder ensemble in banker stripes. Pick an outfit that can take you from the bus station to the boardroom. When you imagine just how long you'll be waiting for a ride or navigating through horrendous traffic, you may be tempted to wear track pants and a comfy tee. Even if you're allowed to dress casually at work, resist the urge to wear a sloppy outfit. Dress comfortably, but don't forget to dress for the occasion, too. For starters, slip on a pair of chic flats for happy feet. Have a cover-up on standby—just in case. You decide to wear a sundress and a pair of sneakers to work—it's casual Friday, anyway. Remember how the boss sometimes likes to tap just about anyone to client meetings at the spur of the moment? A linen blazer that goes well with your canary yellow sundress can save you in emergency situations. A bag that can store your belongings as you steer through your everyday commute is great, but having a carryall doesn't mean you have to put everything in it. Bring only what you need, because you don't want to end up bringing an extra bag and a laptop bag when you realize one giant tote just isn't enough. No matter how hectic your schedule is, make time to doll yourself up even with only a bit of cheek tint and your favorite lipstick shade. It'll boost your confidence. The metro exposes you to harmful elements, with pollution and UV rays affecting your health and appearance. Hence, having city-ready skin is necessary. 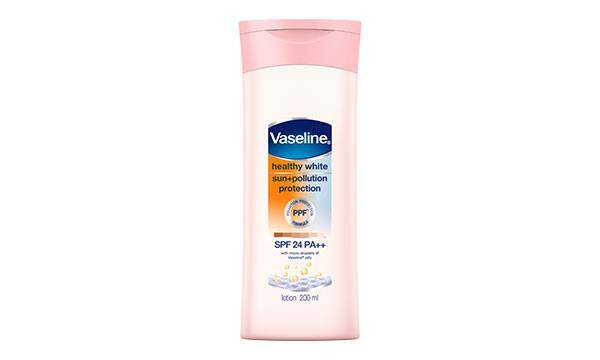 Before you step out of the house, apply Vaseline Healthy White Sun + Pollution Protection lotion to your skin. The lotion has the right amount of SPF (Sun Protection Factor) and PFA (Protection Factor of UVA) to help protect your skin from sun damage. It also has PPF (Pollution Protection Formula) that fights pollution while moisturizing your skin. Vaseline Healthy White Sun + Pollution Protection lotion also contains glycerin, stearic acid, niacinamide, vitamin E, and petroleum jelly—ingredients that help keep skin fair, moisturized, and protected. Say no to dull, uneven-toned, and damaged skin with Vaseline Healthy White Sun + Pollution Protection lotion. It's available in all leading supermarkets, department stores, and drugstores nationwide, and online through Lazada.